Because I love to sew. 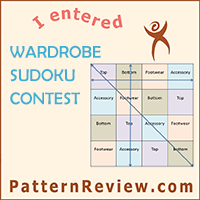 The ongoing Shirtdress contest at the Pattern Review website got me browsing through my pattern stash. 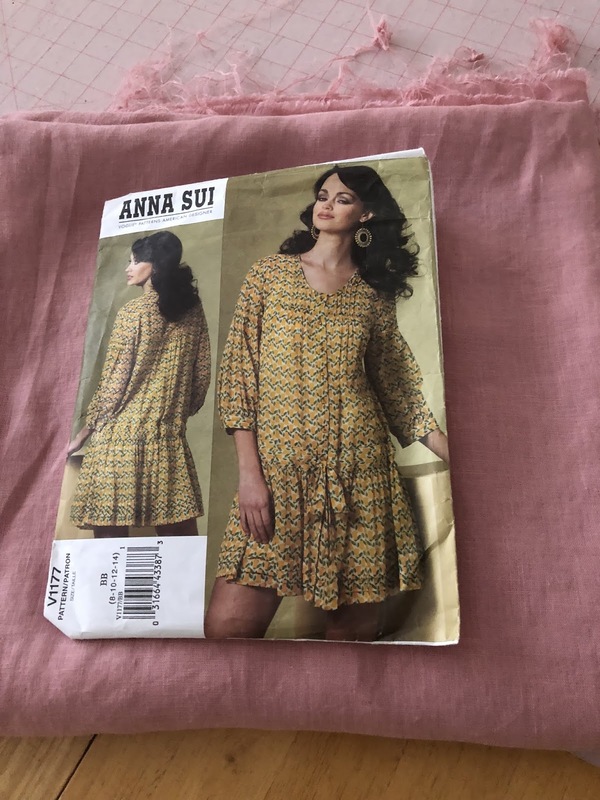 I have two copies of this Vogue 1177 by Anna Sui because the first time I made it years ago for my daughter, it turned out so cute that I decided to buy an extra copy just in case. 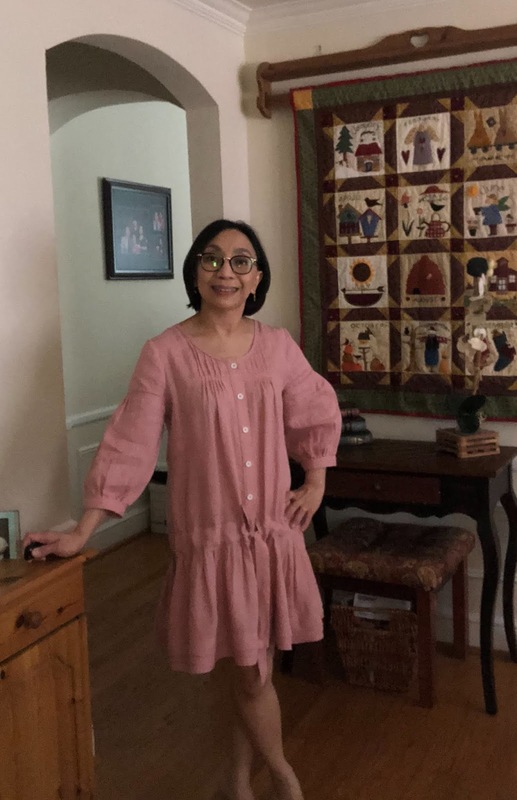 So that extra copy has now been cut and I have myself a cute and comfy shirtdress. 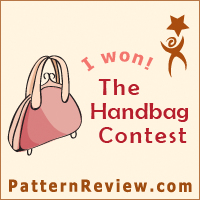 I posted a complete review of the pattern on Pattern Review.com. 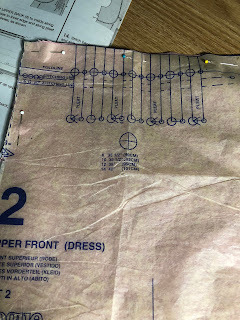 Even though this pattern was released in 2010, the design features still work to this day. The sleeves alone can be deemed a nod to the Statement Sleeves trend. 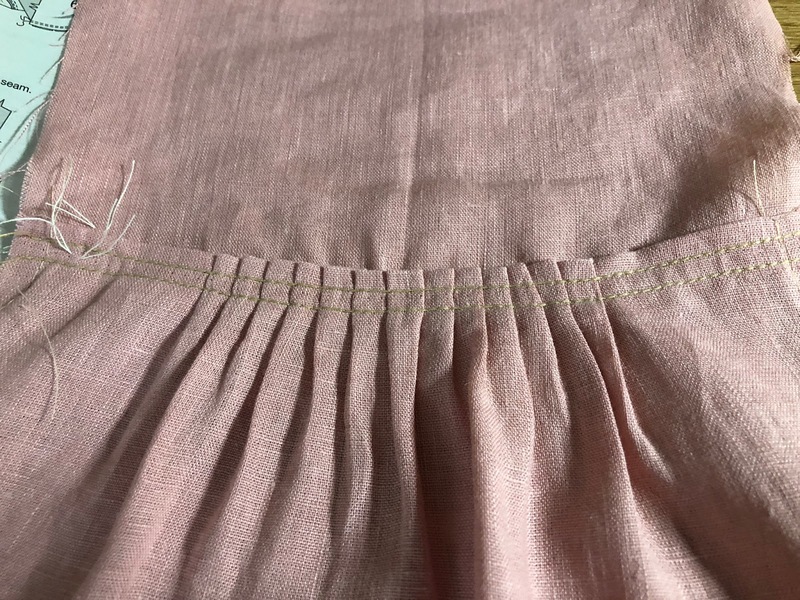 But what I really loved were the details that worked so well with linen--pleats, tucks, gathers, folds. However, all those details also meant a little bit more work. 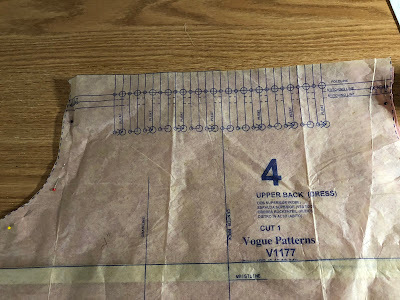 There are seventeen pieces in this pattern and a lot of markings in them. 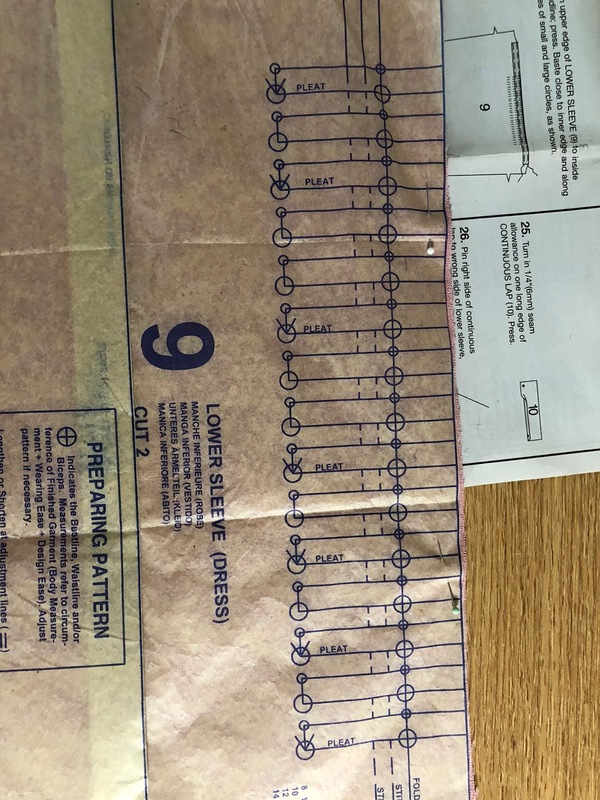 Just a few examples of the pattern pieces with all the markings. 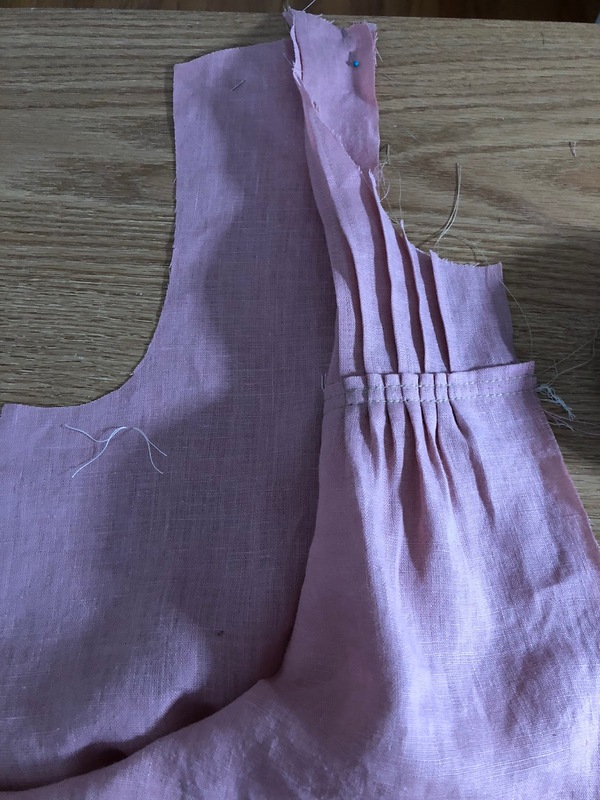 The first time I sewed this, it was really a frustrating experience because I used a very slippery printed chiffon and all the design details like pleats and tucks posed some challenges. 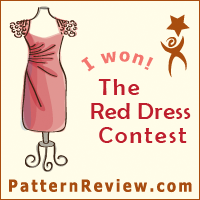 It was worth it though because it became one of my daughter’s favorite dresses. 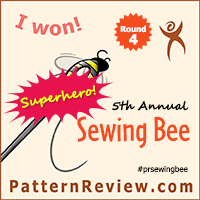 Too bad I was not blogging or reviewing my sewing projects then. This time, I decided to use a very lightweight linen (also called handkerchief linen) which is also one of the recommended fabrics for this pattern, in addition to batiste and chiffon. I bought my linen from Fabrics-Store.com. 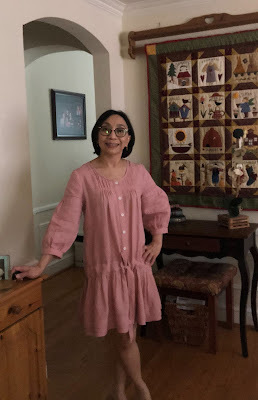 It was my first time trying that online store and it was such a delight to see all the different shades of linen available in different weights and at very reasonable prices. Mine was a lovely shade of blush and had a weight of 3.5 oz/sq. 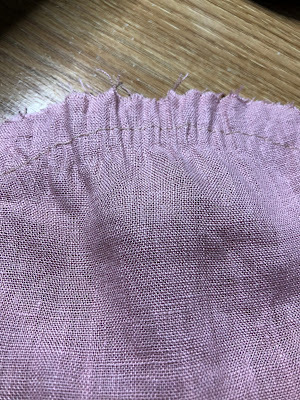 yard (fabric code was IL020). It is a bit sheer but not transparent and has been softened. 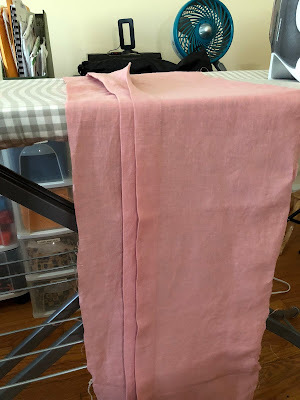 To prepare it for sewing, I prewashed in the washing machine using cold water and threw in the dryer, took it out while still damp and hang to dry. Some recommend doing the process times but I did not have the patience to do it and I really was not keen on using up my laundry quarters for one piece of fabric! Microtex size 60/8 for general sewing. Topstitch needle size 90/14 for topstitching and edgestitching. 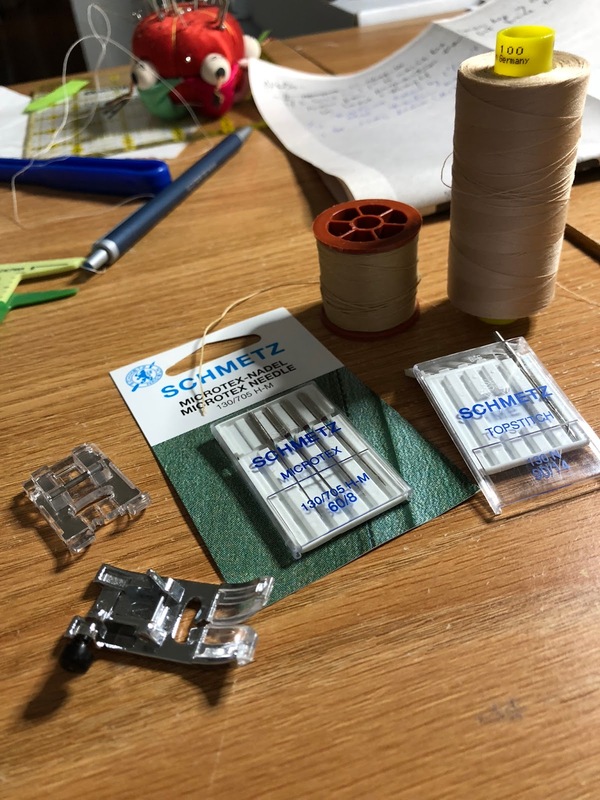 Guttermann polyester thread for general sewing. Dual Duty Plus button & craft thread for topstitching, edgestitching and handsewing buttons. 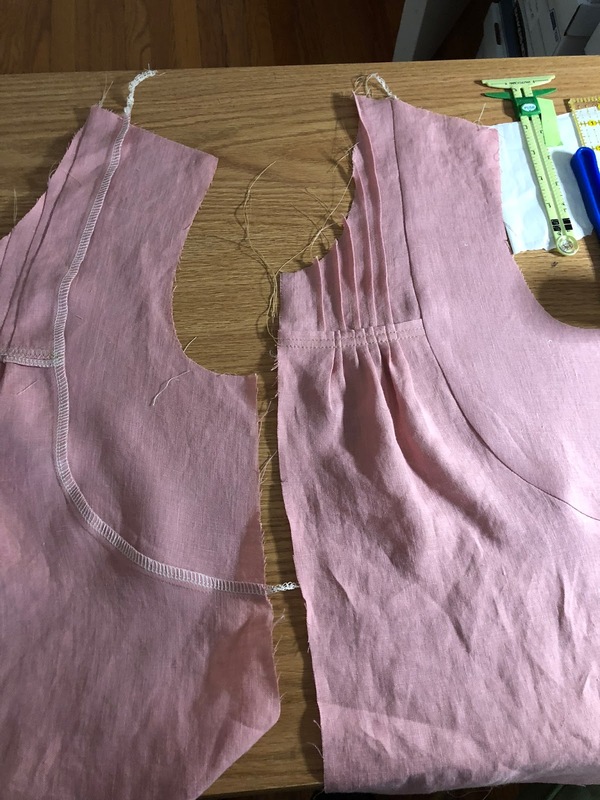 Although the number of pattern pieces and the details that accompanied them looked intimidating at first, it was not really hard to sew. The instructions were easy enough to follow although I found them lacking in details that would have been helpful in achieving perfect results. So as I followed them step by step, I also tweaked them where necessary to achieve the results I wanted. 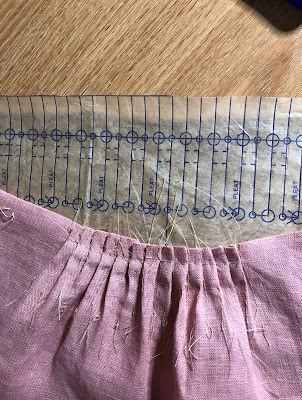 Step 2: To minimize marking on my fabric, instead of drawing the foldline for the tucks, I just snipped along the top and bottom of the yoke piece and pressed a straight foldline. 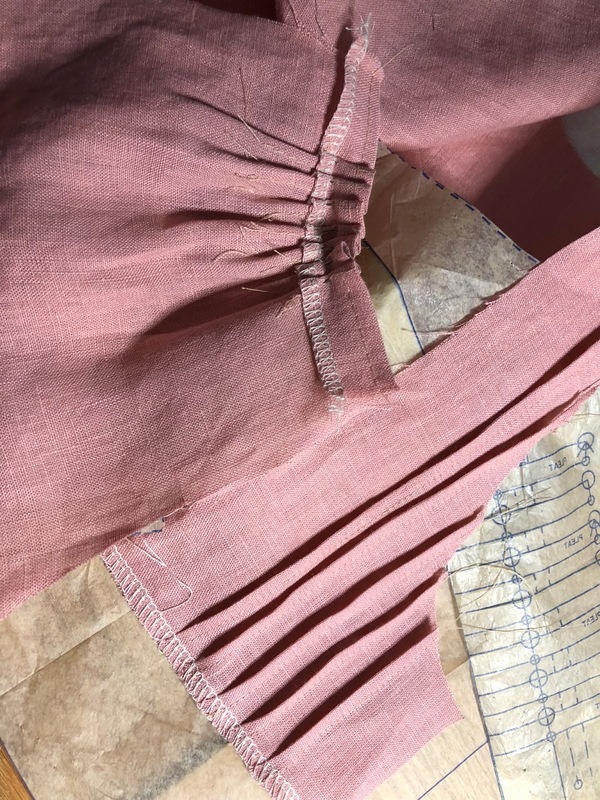 The instruction asks to use a scant ¼” for the tucks. To do this, I moved the sewing machine needle to the right. 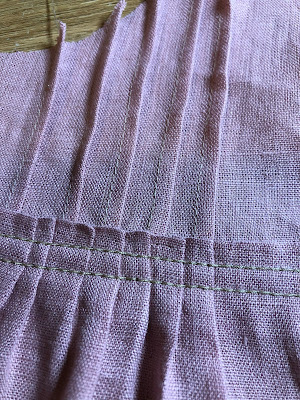 Tucks sewn on two upper front pieces. 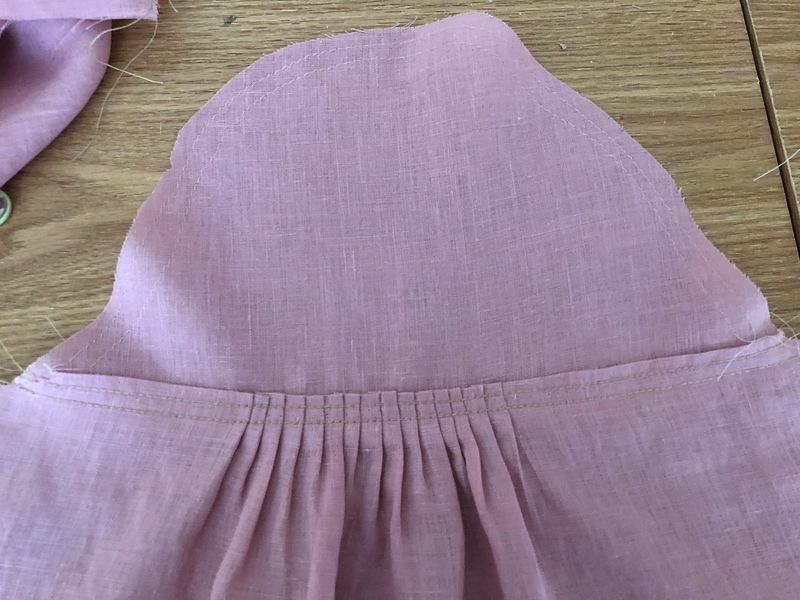 Step 3: The instruction asks to fold the piece then do the pleats. This is the point of no return so one has to make sure to finish the raw edges first before doing anything else. It is also easier to use a basted guide instead of a handful of markings along the top and bottom of the piece. The guide makes it easier to attach the corresponding piece accurately. I used long machine stitches for this. 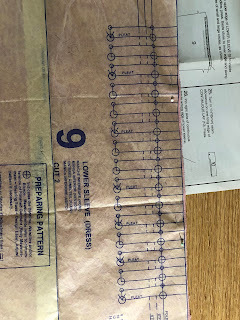 Pattern piece showing the pleat markings. Serged raw edges before pleating. 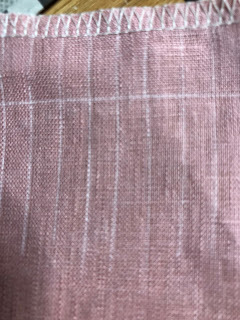 Pleating marks shown above. These are the upper front and lower front pieces which will be joined eventually. The lower front will overlap the upper front and then topstitched so it helps that all raw edges have already been finished. A closer look at the finished front. Step 7: This involves attaching the curved yoke to the front. 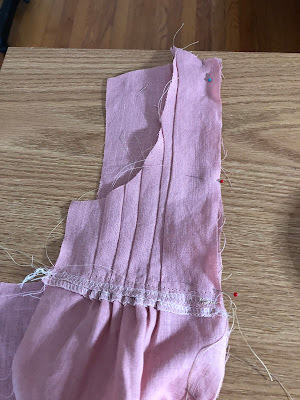 When sewing curved pieces together like in princess seams, I always put the piece with more ease at the bottom so it is the one touching the feed dogs. I don’t use a lot of pins, just along the matching markers. Then I ease in the bottom piece as I sew along. Doing so let’s me get away with clipping curved edges. 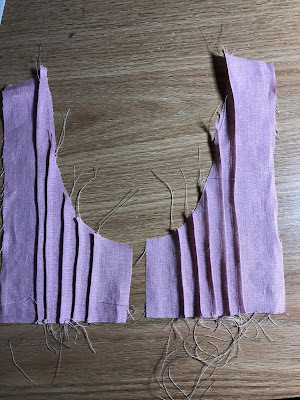 Step 9: This is all about the back pleats. 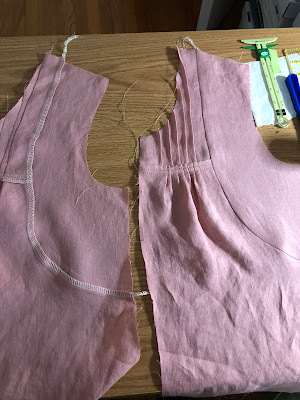 Now the back piece is a single piece of fabric with no center back seam. What I found not to my liking was the pleats were drafted to face in only one direction. I decided to mark my center back and reverse the pleats so they are facing the opposite direction from the center. It made more sense to me that way. All the arrows in the pleat markings point to one direction from left to right. 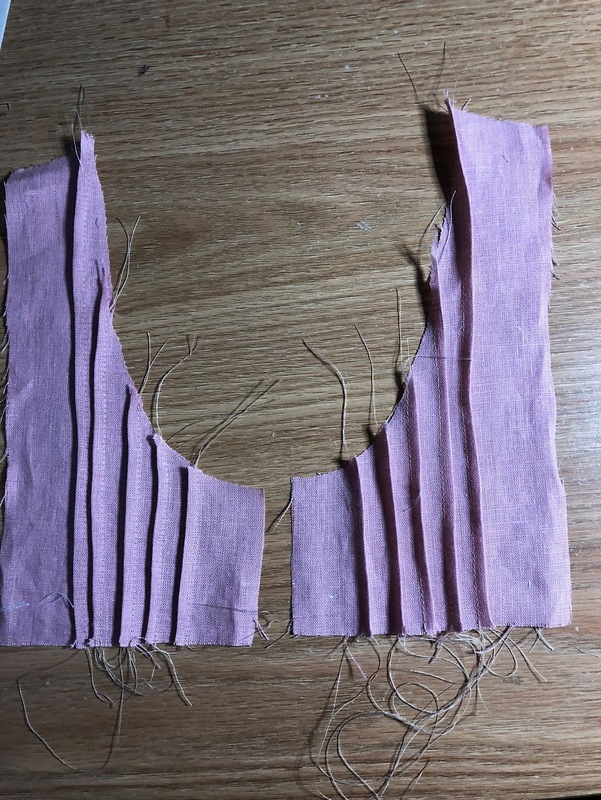 Reversing the direction of pleatings from the center seemed better to me. 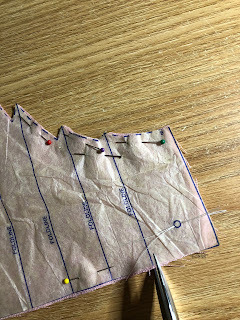 Step 19: I found the sleeve caps to have too much ease for my liking. To easestitch the cap, instead of sewing the traditional two lines of long machine stitches in between the markings, I followed a neat technique I read on the Craftsy blog " Quickest Way to Ease a Set-in Sleeve." I am not going to attempt to explain it here as the Craftsy tutorial was well illustrated and easy to understand. Using the technique resulted in really finely eased sleeve cap. No need to pull any gathering threads at all. The sleeve cap is nicely eased without any glaring pleats showing. This was before ironing. 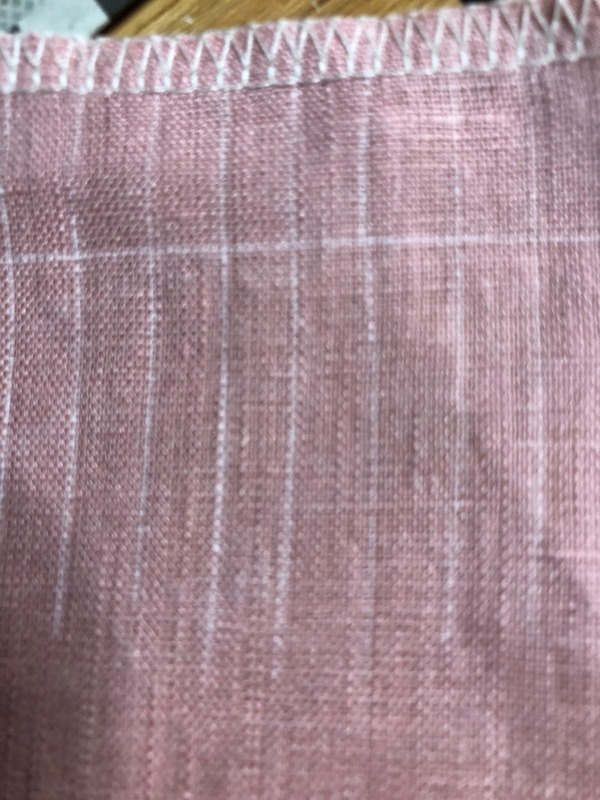 After ironing. The sleeve cap looked smooth! Step 24: I did not slash the sleeve right away until I was ready to attach the facing. That way, I minimized raveling. The facing piece (no. 10) was one size so do not be surprised if it does not match the slashed edges length for length. Mine had a lot of extra which I just trimmed. Facing attached to the lower sleeve cuff opening. View of the cap sleeve attached to the lower sleeve. 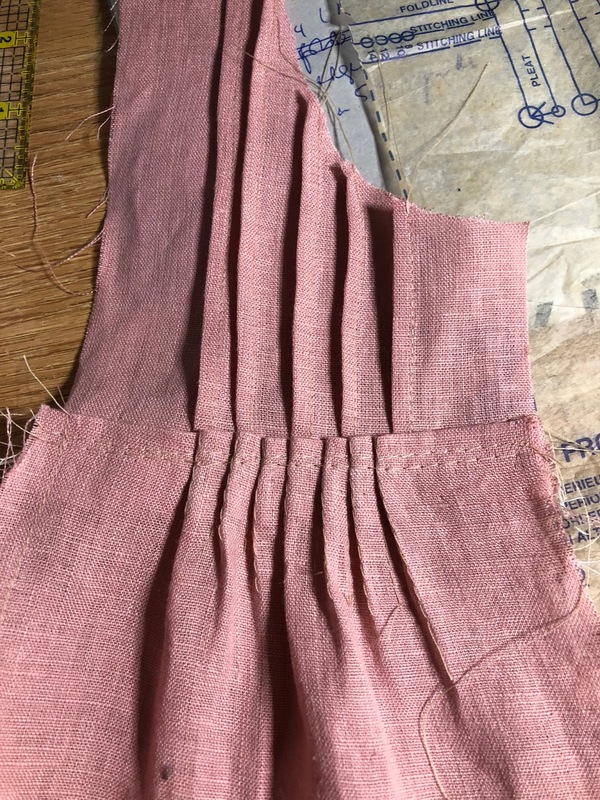 Even the lower sleeve was pleated! 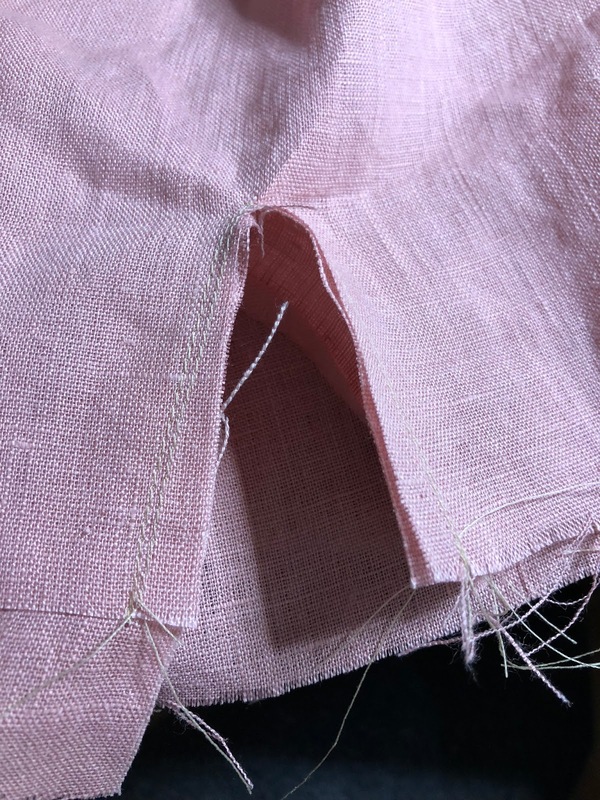 Step 37: Instead of tracing the two foldlines and stitching lines on the lower skirt section, I just measured the distance of the lines from a reference point, mine being the bottom hem edge. Then I pressed to mark the foldlines. After that I measured the distance of the stitching line from the foldline and sewed from there. 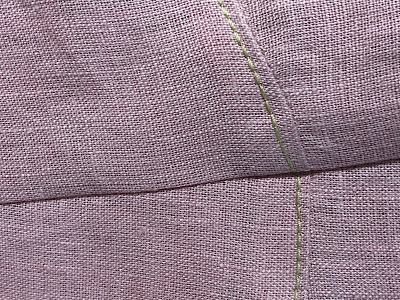 *To make the topstitches stand out, I used longer stitches and thicker thread for the top thread. 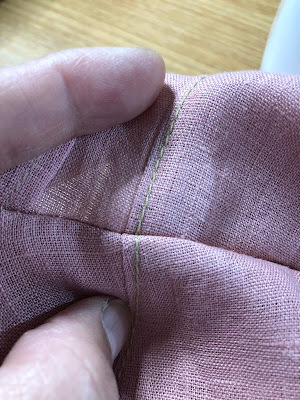 *To mark the buttonhole location on my front band, I sewed long basting stitches by machine. 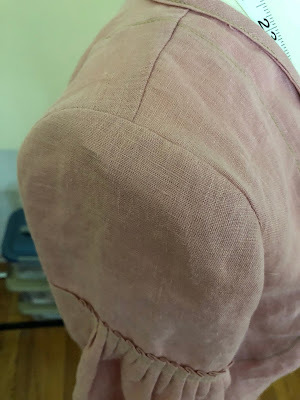 Finally here are some pictures of the finished garment and close-up photos of the fun details. Larger views of the individual photos can be seen in my Flickr Album. Well done...........VERY well done! So cute! I'm afraid I might not have the patience to sew this one. Thank you! Haha, true it requires some patience. I had to take breaks and pace myself so I could enjoy the process. Honestly, you are so amazing! 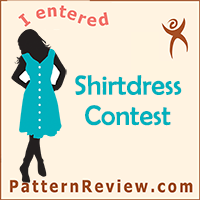 I'm so glad I didn't enter the shirtdress contest, lol! Yours looks fabulous!!!! Thanks so much Diane! 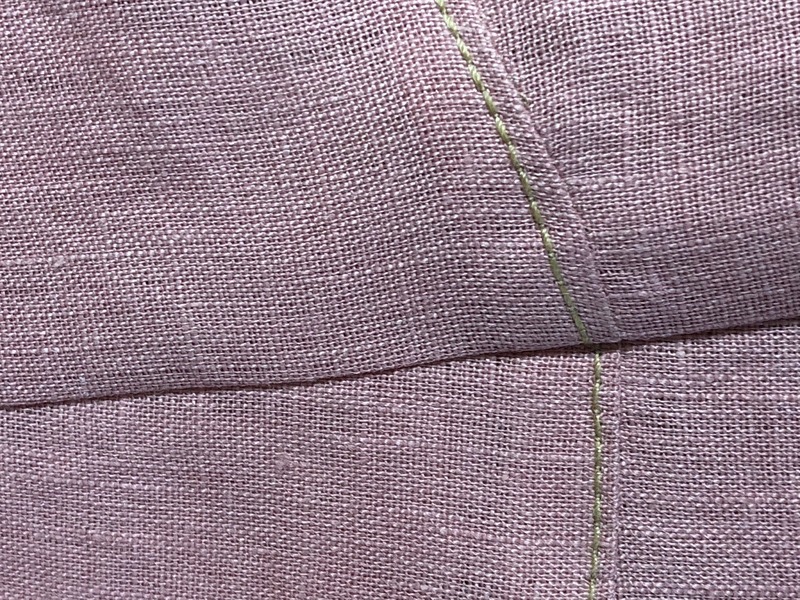 Right now I am in love with linen because it’s such a pleasure to sew! 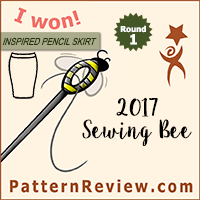 I have left a comment on Pattern Review, but wanted to thank you here, as well, for your wonderful blog post. Truly, outside of sewalongs, offered by pattern designers, I have never read a post that was as informative and helpful as this one. I don't read many blogs, but I have subscribed to yours today, because I am convinced that I can learn a lot from you. I know that it takes a lot of time to take all of those excellent photos, not to mention that it necessarily disrupts the flow of your work. 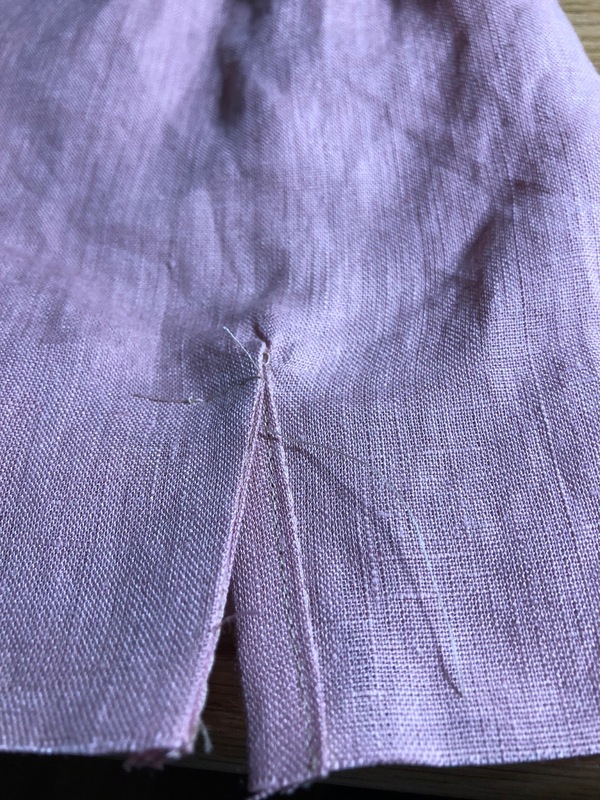 I have been sewing for only three years, and really appreciate your including the precise specifications for your needles, thread, weight and source of fabric, in addition to all of your techniques for handing the many fine details of this design. 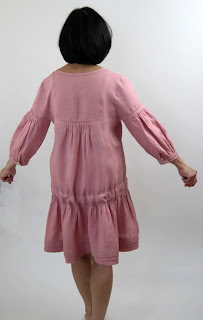 Were it not for your blog, I would not even have considered trying this dress. You have emboldened me, so that I have purchased the pattern, and plan to order fabric with the same specifications as yours. THANK YOU!!! OMGosh, your comment just made my day! I must admit, there were times when I toyed with the idea of giving up blogging because it seems like most everyone has moved over to Instagram. 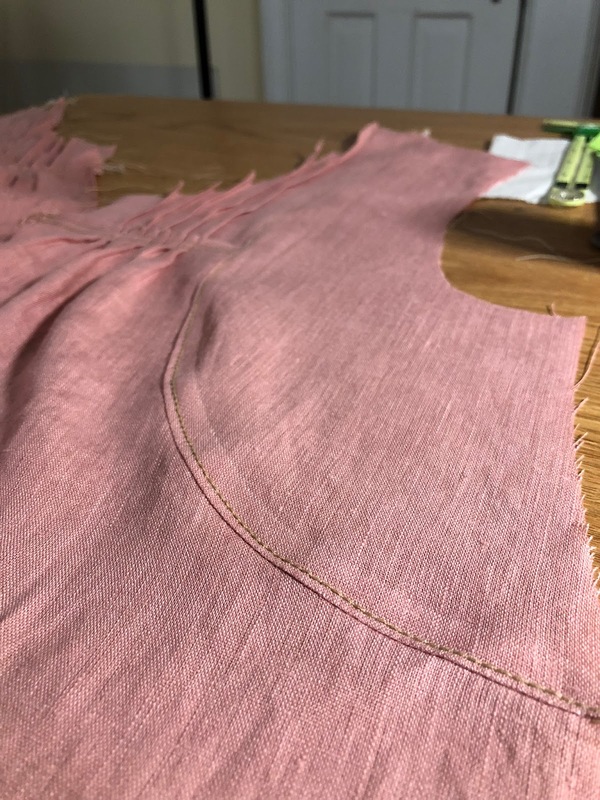 But then I realized even when the day comes that no one will read my blog, I still do refer to my own posts when I revisit some patterns I have sewn. So I still keep on posting! I learn a lot from other online tutorials too so I’m glad that I could contribute something useful too! 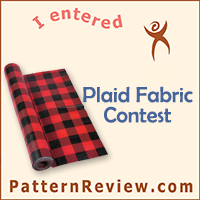 I’m so excited that you’re going to tackle this pattern. Good luck and hope you’ll enjoy the process as much as I did! And thank you so much for all your kind words! A doctor by profession, I'm a mom by vocation. Here I have logged things I have created--with needle and thread, hammer and nail, pots and pans. These are chronicles of my creative pursuits.